We traveled to Vernal this week for a vacation. 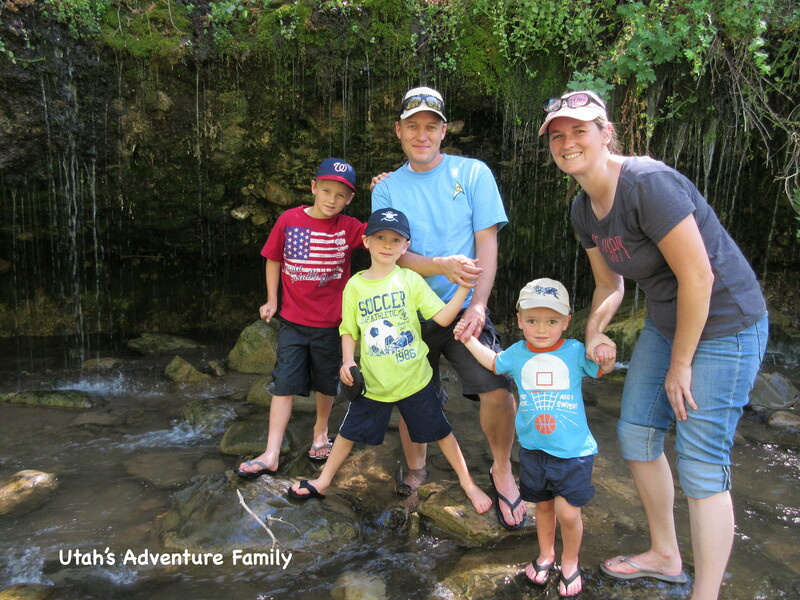 We figured there were a lot of adventures to be had in this part of the state, so we stayed for three days. Vernal and this area is known as the Dinosaur Capital of the World, and that’s exactly what we came to see. 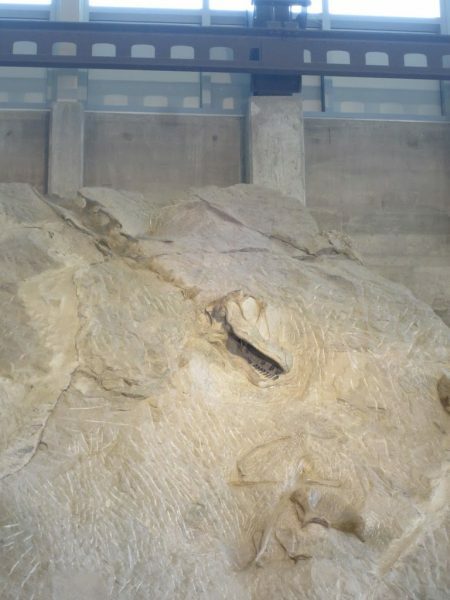 We started at Dinosaur National Monument. The visitor’s center isn’t much– a gift shop, a short film, and a couple of dinosaur bones, but there is plenty of other stuff to see. (Note: we only visited the Utah side as the Colorado side is still closed in early April). The highlight of this adventure is the open quarry. 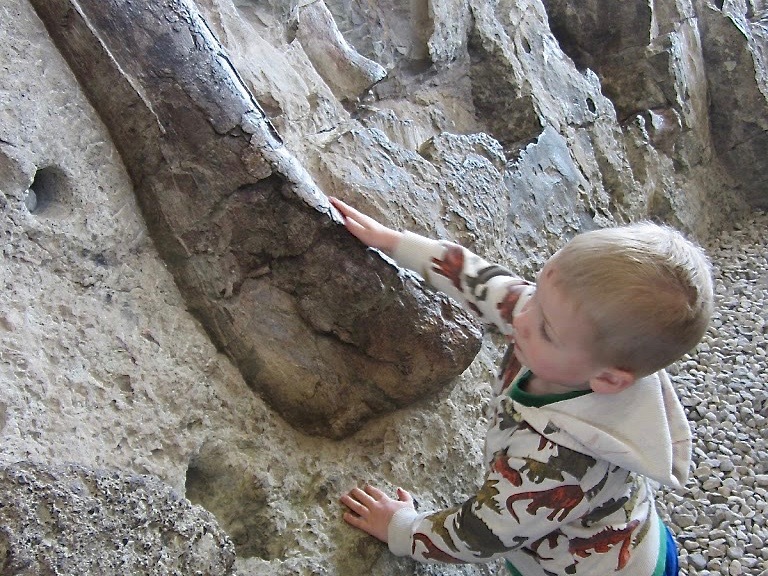 This excursion is done at certain times of the day (check the website) and is a ranger-led trip to a special building that covers a huge dinosaur dig. Though the dig is no longer in use, over 1,500 bones representing 100 individual animals and 10 species have been excavated. About one-third of the dig has been left as a tourist attraction, and it is amazing. 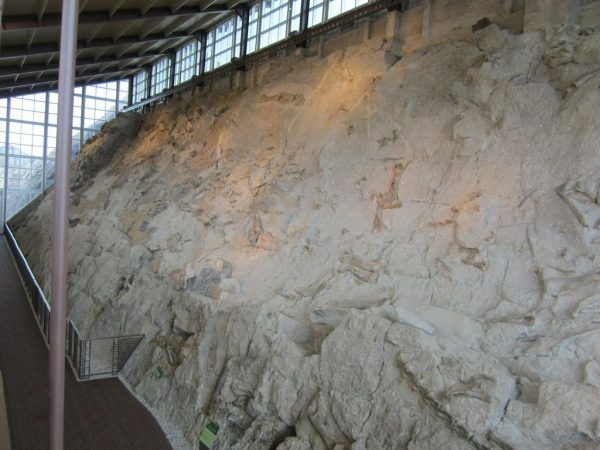 It makes you wonder how all those dinosaur got in the same place and were preserved for 149 million years. We loved this fossil in the Quarry. 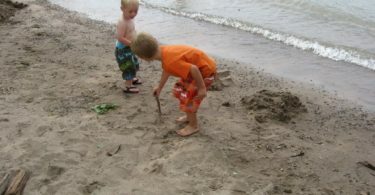 Our boys loved all the fossils in one location. 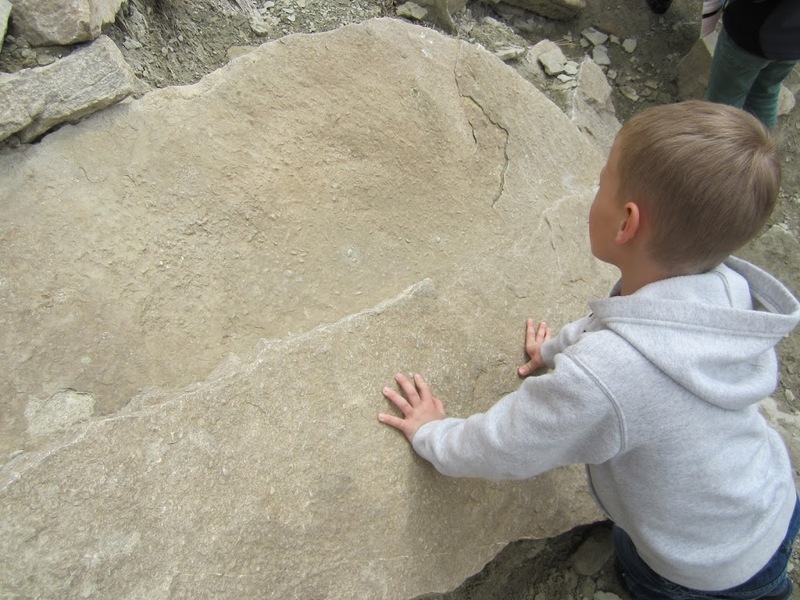 There are a few fossils you are allowed to touch. 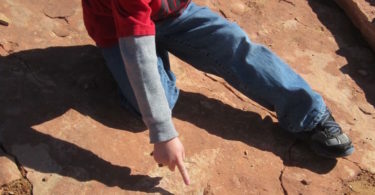 Fossil Discovery Trail has lots of small fossils to see. There’s a really nice hike before you leave the quarry. It’s short and you get to find fossils on your own. Leave your car parked in the quarry lot and walk down the road about 50 yards. You’ll see a sign for Fossil Discovery Trail. Hike down the hill and turn left where the trail splits. After a short distance, the trail ends at some clam fossils. Go back to the main trail and continue down. Turn left again at the Morrison Formation. This short but precipitous trail has fossils embedded in the rock on your left. Look closely, and they’ll be everywhere. We didn’t follow this trail any further, but it does loop back to the visitor’s center. We just didn’t know how to get the car back from the quarry! 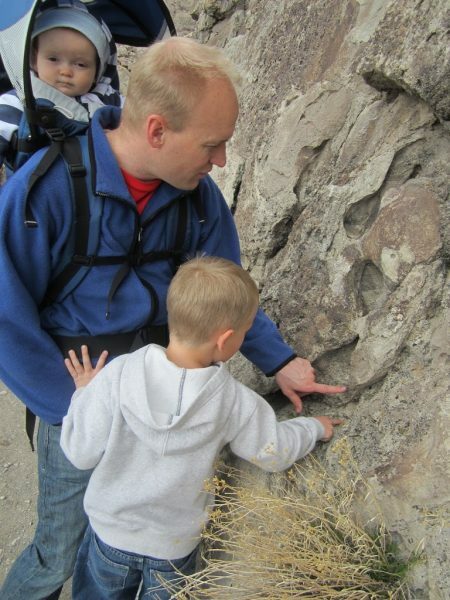 We loved this easy walk with fossils hiding everywhere. 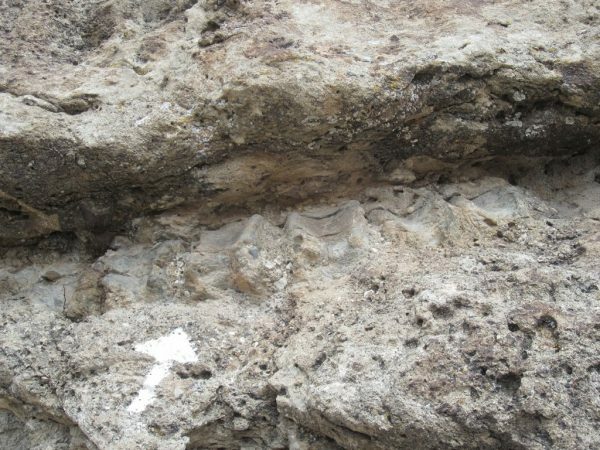 This backbone is along the Fossil Discovery Walk. The Swelter Shelter Petroglyphs are a great stop. 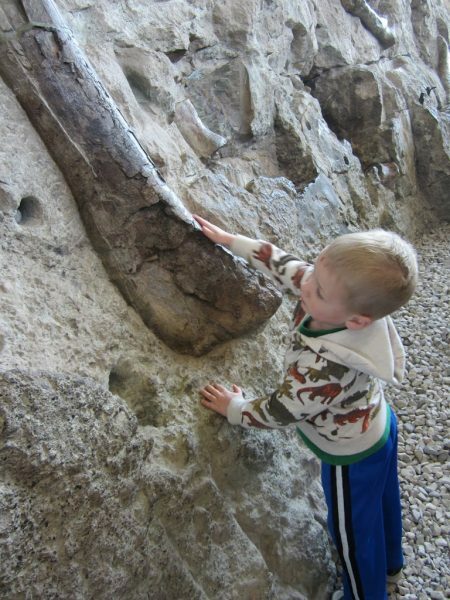 There are other things to see at Dinosaur National Monument, too. 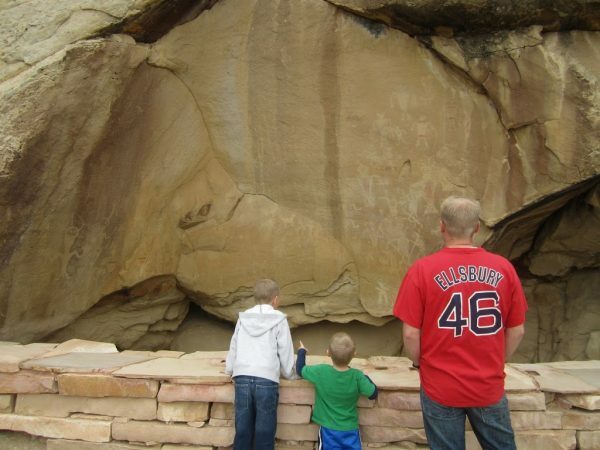 Our kids enjoyed becoming Junior Rangers, and there is a short drive to some petroglyphs and a few hikes. 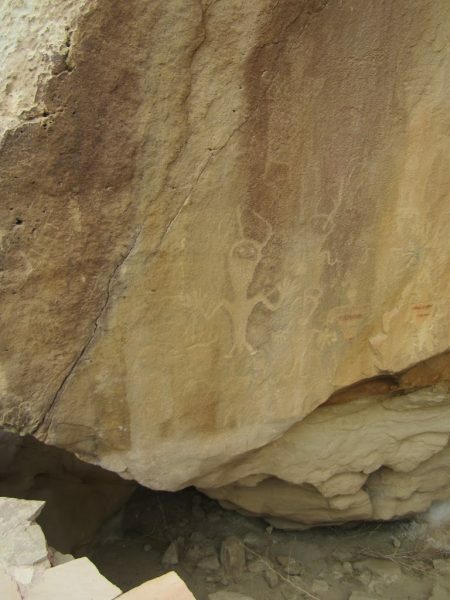 As you drive east of the visitor’s center, be sure to keep an eye out for Swelter Shelter, a short walk to some petroglyphs left by the Fremont people a thousand years ago. The rock formations of layers and striations are really cool to see. 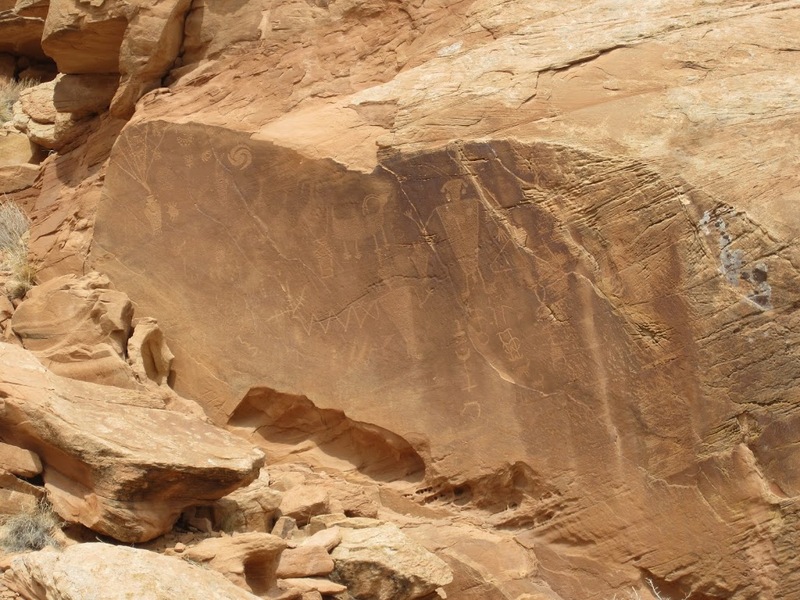 There are several other petroglyphs, too. There are some great petroglyphs. At the end of the paved road, you can continue on a dirt road out to Josie’s homestead. The drive is a little bumpy, but our van made it easily. 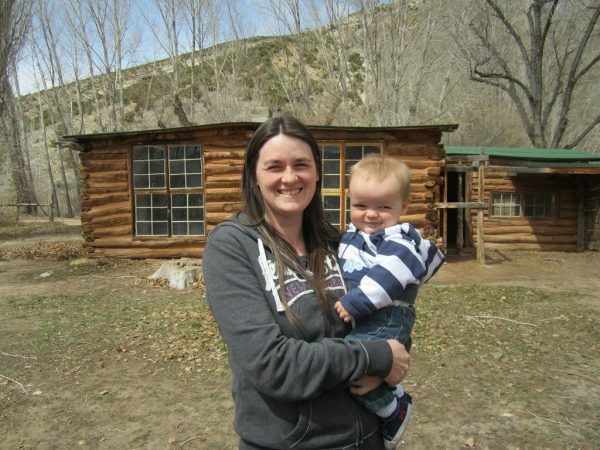 Josie lived in a dirt floor cabin with an outhouse, a small pond, and a lot of cattle (the latter outside the cabin, of course). 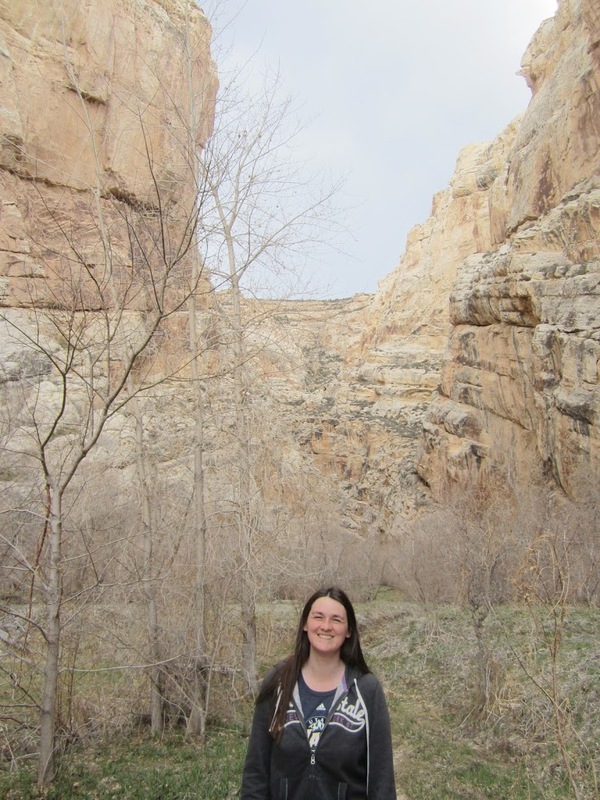 There are two short hikes here, both to box canyons where Josie kept her cattle. The Box Canyon is a short, fun hike. 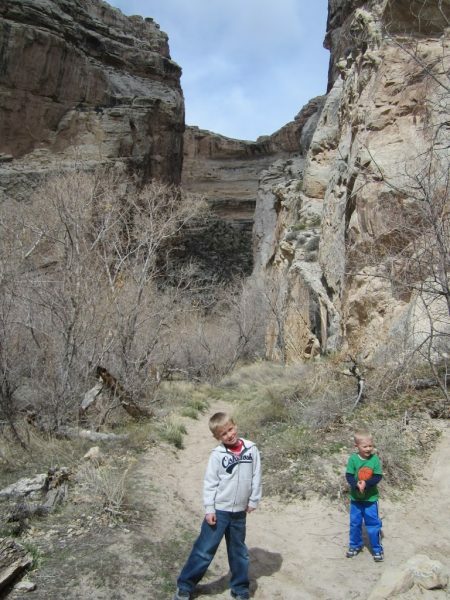 The shorter hike is just a quarter mile each way and is appropriately called Box Canyon. It doesn’t narrow down like some of the more famous box canyons, but our kids really enjoyed shouting and listening to the echo (other hikers beware!) The second hike is a little longer, but still very easy– out and back about 1.5 miles into a second box canyon called Hog’s Creek. Again, we went for the echo. We barely made it out before the rain hit! 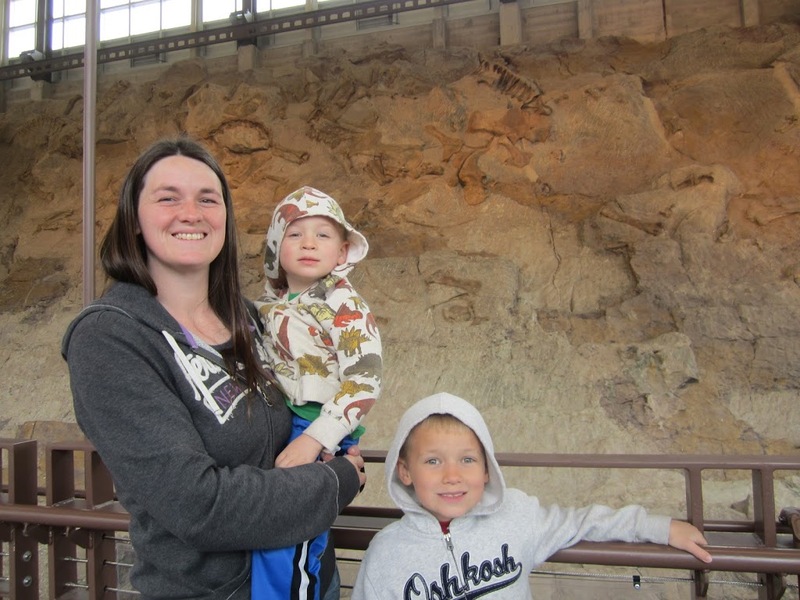 Be sure to check out our other entries of the Vernal area on our Things to do in Vernal post. Do you think if you didn’t teach about Utah history you would even know half of this stuff? Just wondering. I love that Nat is in a picture all by herself.